Stone floor. Stone slabs. 1712. 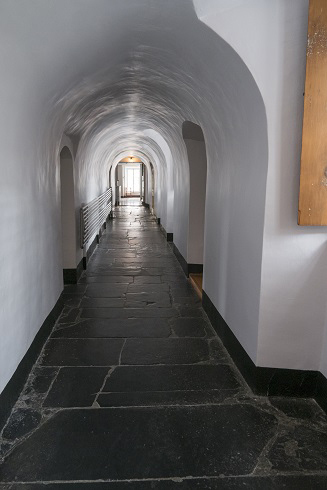 This stone corridor has great meaning for the Monastery and for the history of Quebec. Made of stone slab in 1712, the floor has never been modified. When Wolfe and his soldiers bombed Quebec City in 1759, the sisters took refuge here, because it was the safest and sturdiest part of the Monastery. After the battle, Quebec City was in ruins. The British occupied this space for the first winter. The Ursulines occupied the spaces above them.